I am not one to promote anything that MTV does. I think MTV and their crap programming are definitely one of the worst influences on youth society and culture. It isn’t just the youth of this country they negatively impact, but youth around the world because there is a separate MTV for Europe, one for Asia, and one for Latin America. I’m not sure if the Arab world has a MTV affiliate, but if they do it would easily explain one of the reasons they dislike our culture so much. However, MTV.com did submit a neat question to several respected film directors asking what they would do if they took over the Harry Potter film franchise. Directors like Zack Snyder (300) and Guillermo del Toro (Pan’s Labyrinth) gave some interesting responses. The Potter films have made billions at the global box office, and still have three more to release. I admit that I am a big fan of the Harry Potter books. 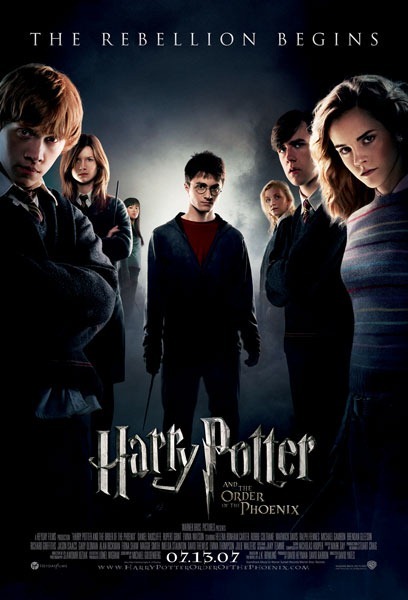 They are well-written by author/creator J.K. Rowling with great characters and storylines. The first two movie adaptations really sucked, but the last two were pretty entertaining. The trailer for the latest film, Harry Potter and the Order of the Phoenix, shows some potential for being a good film. However, we’ll have to wait until it’s released on July 13th before we know for sure. The final book, Harry Potter and the Deathly Hallows, hits bookstores at one second past midnight on July 21st. Click on the link below to read the MTV.com article, but as soon as you are finished turn off your computer, take a hot shower, then pray, do some meditation, and go sit in the middle of a forest for a week in order to cleanse yourself of the taint that being near anything MTV can leave. Click here to read the MTV.com article. Click here to visit the official site for Harry Potter. Watch the Harry Potter and the Order of the Phoenix trailer here. Read about the history of Harry Potter here. I don’t have much of a comment other than to agree with Zack Snyder that you don’t really have much latitude with the series – you have to follow the book. That makes this question less interesting than the “What would you do with the James Bond franchise?” question. Props to super spy y, though, for presaging George Miller’s comment in his “To Kill An Icon” post. Miller’s quote in the MTV article parallels y’s post pretty well. Thanks for the props, moviemanZ. I take back what I said about your wife being more in love with the spin cycle of your washing machine than she is with you. However, I’m not taking back my comment that your dog is completely gay (not that there’s anything wrong with that). You have to admit that he licks one area of his body way more than is necessary… even for a dog. That was uncalled for – and, dare I say, libelous.